Arena Financing Creative Private Financing. Naming Rights Air Canada paid C$40 million over 20 years. Three group sales areas including a 200-seat gondola. With loge suites at the east and west ends of the bowl, the arena is not a traditional "racetrack" design. Rather, Air Canada Centre has excellent sightlines with a stated intention of bringing patrons closer to the action. Seating Distance (Basketball direct line of sight) Sideline to last seat upper deck 165 feet (50.29 metres) Baseline to last seat third balcony 167 feet (50.90 metres). 1998-1999 - Attendance for 14 games at the Air Canada Centre and 27 games at Maple Leaf Gardens. The Air Canada Centre, located right in the downtown core, is a world-class sports and entertainment facility and is the premier arena for professional hockey and basketball in North America. Designed with the fans in mind, the focus is on intimacy and customer experience. The seating capacity for hockey is 19,500 (including 1,500 fans in 150 Suites and 300 in Standing Room) with excellent sight-lines throughout. The facility will also house a club restaurant and bar with a view of the ice. There will be televisions throughout the building, including all washrooms. One percent of seating in the building has been designed for the disabled, offering physically-challenged individuals a choice of various ticket prices. The Air Canada Centre has all of the characteristics of a first-class, technology-advanced facility while maintaining the spirit and legend associated with that of Maple Leaf Gardens. DESIGN ELEMENTS Air Canada Centre is built on the site of the original Canada Post Delivery Building and retains the historic east and south walls. A conservation program is in place to maintain the integrity of the original building facade including the restoration of stonework, bas relied panels, and replication of historic window profiles. In addition to the arena, a 140,000 square foot 12-storey office tower, The Air Canada Tower, has been constructed in the northeast corner of the site, adding to the skyline presence of the project. Air Canada, a major building partner, takes residence in the top six floors with Maple Leaf Sports & Entertainment, Ltd. occupying the remainder. The steel roof is 40 feet above the existing facades, and has a profile designed to be flat, giving the appearance of a hangar. This allows for better acoustics inside and a prominent city presence outside without blocking the view of other landmark buildings. GALLERIA Running in an east-west direction just south of the GO train tracks, the Galleria is a public walkway located at the north end of Air Canada Centre. It is a covered, climate-controlled walkway that will house the ticket office, food court and other retail establishments. In addition, a historical display of artifacts from the original Canada Post Delivery Building and site is a prominent feature. It is expected that 60 percent of guests will enter Air Canada Centre through the Grand Entrance, located in the Galleria. PATH WALKWAY SYSTEM Air Canada Centre is connected to the well known PATH system, providing covered access to the downtown core. PATH reaches as far north as Dundas Street, Two grade level connections, referred to as the Bay West Teamway and the Blue Route provide convenient access from Union Station to the arena's Grand Entrance. FAMILY CONSIDERATIONS Air Canada Centre is considerate of fans of all ages. A children's play area will be on the main level concourse. Baby change tables will be in all washrooms, as well as lower urinals for children. More than 650 television screens, complete with cable, satellite and replay ability, will be located throughout the concourses and washrooms so fans don't miss a minute of the action. ECONOMIC STIMULUS Over the next 10 years, this additional spending, combined with arena and team operations, will result in a total economic benefit of $2.4 billion. The construction will be the impetus for other downtown development associated with the railway lands east. Approximately $13 million in public infrastructure elements will be advanced by at least five and up to as many as 15 years ahead of schedule through private financing in conjunction with the project. 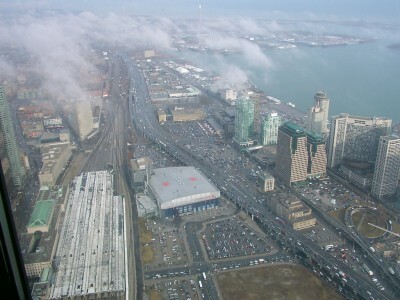 Projects include: the Bay West Teamway, Union Plaza, the Galleria, Bremner Blvd. And related infrastructure. No public funding will be used. NEIGHBORHOOD Located in the heart of the city, the arena is close to the CN Tower, theatre district, restaurants, 15 major hotels, shopping and two main transportation arteries; The Gardiner Expressway and Union Station, which services the Toronto Transit Commission (TTC) and GO train. The project also begins the development and revitalization of the area know as the Railway Lands East. Air Canada Centre provides an excellent link between the downtown core and the Harbourfront, one of Toronto's major tourist attractions. The arena will be user-friendly, providing 1% of fixed seating for the disabled and their companions. Accessible seating areas are strategically located throughout the building, providing maximum flexibility and pricing selection. Among other features, all public washrooms are wheelchair accessible. Food and beverage service counters will be lowered to accessible service heights. The amount of dirt, which was excavated from the new Air Canada Centre site, is equivalent to filling 2,000 household pools. Total concrete poured is 27,128 cubic metres -- enough to make a five-foot-wide sidewalk from Air Canada Centre to Niagara Falls. There is 2,000 tons of steel in the Air Canada Centre -- that is equivalent to 2,000 average size cars. Ten kilometres of steel piping were installed for the ice rink alone. The ice surface has enough ice to make up 2 million one-inch ice cubes. There is enough wire in the arena to stretch from P.E.I to Vancouver. The total worker-hours used in the construction of the Air Canada Centre is about one million. The tallest player in the NBA is 7-foot-7 tall; the height of the doorframes in the Raptor's locker room is eight feet high. There are over 650 televisions throughout the arena, many of which are located in the washrooms. 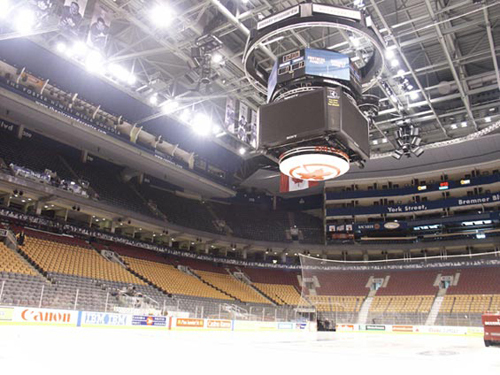 It would take 300 televisions to make up the size of the 16-by-9 inches video boards at Air Canada Centre. The average number of hot dogs sold at a single event is approximately 1,800. There are 15 concession stands throughout the Air Canada Centre, two restaurants that are open to all fans and three others that are members-only. Air Canada Centre has 56 washrooms. The total wattage of lights used for a basketball or hockey game is 308,000 -- or enough to light an average school for more than a week. The Air Canada Centre house sound system can reach levels of 96 decibels, comparable to a 747 jet taking off 1000 feet away. The six copper kettles in Lord Stanley's Mug will produce 2,000 HL (equivalent to 600-thousand bottles of 25-thousand cases) of freshly brewed beer. Head Brewer is Roxanne Diakowsky, one of only a few female brewers in Canada. The Air Canada Centre has almost 1000 part- and full-time workers. - A blend of the historical "Postal Delivery" building and today's modern arena design, not a "cookie cutter". - Fully upholstered 20 - inch seats . first "Soft Seat Arena". - 40 unique courtside lounges located within the 100 level and 65 luxury suites located on the 200 level. - A themed food court - "St. Lawrence Market" concept. - A themed Galleria with team store. - An interactive "Raptorfest" area. - An interactive computer centre. From the Airport - Take Hwy 427 South to Queen Elizabeth Way (QEW) East (Toronto). QEW turns into Gardiner Expressway. Exit at York Ave. North and continue one block to the arena. - In the heart of a 4 million market place. - Part of the downtown "Path System"
January 1998 - June 1998: Arena Roof. May 1998 - August 1998: Building Enclosure. March 1998 - January 1999: Interior Finishes and Fit Out. February 1999: Air Canada Centre Grand Opening. 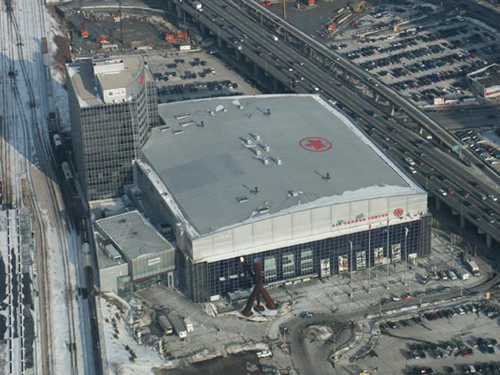 March 3, 2002 - This beautiful arena opened in February, 1999, and was originally planned as a basketball arena and a permanent home for the Raptors. Common sense eventually prevailed, and rather than building two arenas for their teams, the design was modified to accommodate both the Raptors and the Leafs. Our greatest concern was how the Maple Leafs could ever duplicate the grace and musty charm of one of the hallowed grounds of hockey - the venerable Gardens. Of course, nothing will ever really replace Maple Leaf Gardens, but they did a great job trying. The arena is located right downtown, at the foot of Bay Street and adjacent to Skydome. One of the best ways to go to the arena is via the TTC subway system. Trains run every 4-5 minutes. You get off at the Union Station and from there it is a completely enclosed walk through the train terminal and right into the Air Canada Centre Galleria pavilion. The building is easily accessible with covered walkways to the GO Trains and the TTC subway system. If you do drive, you can see the arena right along the Gardiner Expressway. Exit at Yonge Street or Bay Street, and seek out parking anywhere there. Prices run CDN$20 outside the building but drop a bit once you walk further. Expect to pay at least CDN$10. Even though the ACC is right downtown, the venue is somewhat landlocked, with the Gardiner Expressway abutting one side and the train station and its tracks on the other. If you want to walk to the attractions and the downtown core - simply traverse the viaduct and you are on Front St. And of course, on the corner of Front and Yonge is THE Hockey Hall of Fame, a must see during your stay here. If you walk the other direction (under the Gardiner), you will eventually find yourself at Queens Quay and the bustling Toronto waterfront. Just a short walk west is Skydome and the CN Tower. Yes, lots to do and see here!!! We have to mention the Galleria, which serves as the pavilion and the main entrance to the Air Canada Centre. Here you will find the ticket offices, merchandise store, Fan Zone interactive games, old Maple Leaf exhibits and a tribute to Poste Canada, the Canadian postal workers. This site actually housed the main post office here, and the shell of the building was kept and incorporated into the arena's design. Once you walk through the turnstile, every where you look there is memorabilia of the Leafs and the Raptors - old exhibits brought from the Gardens interspersed with new material. Take the time to look at the murals and photographs - they are spectacular. There are several restaurants and bars right in the arena - Rickard's microbrewery on the 100 concourse, adjacent to a cool pub called "Lord Stanley's Mug", the Original Six bar behind the blues in one end zone, and for club seat holders - the Air Canada Club concourse, inlcuding a premium restaurant in the east end zone and also overloooking the seating bowl. They sort of emulated the seating colors at the Gardens - golds, reds, blues, greens. They also added "platinum" seats in the first few rows, which gives you access to a private and exclusive lounge at ground level. In the center is an awesome four sided scoreboard with four crystal clear Sony jumbotron video panels, and dot matrix information presented on a circular board. Along the balcony are synchronized changable ad panels, interspersed with dot matrix information boards on 4 sides. The press box here is named the "Foster Hewitt Gondola" in honor of one of the greatest broadcasting legends in NHL history, who called Leafs games a generation ago from the gondola at the Gardens. In addition to the Air Canada Club seats and the platinum seating, one can find suites in three different configurations - along the sidelines at the top of the 100 level, skysuites in a gondola high above the rink, and three levels of suites in each end zone above the upper level seating. A great variety of food awaits you here - the classic Canadian chains "Pizza-Pizza" and "Tim Hortons" stands are everywhere, not to mention the "Good Humor" ice cream stand. (Shouldn't it be "Good Humour"???) The unique items that caught our eye were a sushi stand and a potato pancake stand, both in the east end zone at the 100 level. Hat Trick - to the Toronto Maple Leafs, for their SUPERIOR job in showcasing their teams rich history with endless displays and memorabilia which transforms this building into a museum. Not to be missed is the Esso "Memories and Dreams" display, half way up the escalators to the upper level. Remarkable displays. Hat Trick - to the Toronto fans who support this Leafs team and have done so for a generation, even surviving the Ballard years of futility and misery. This building is sold out night after night, only a scant few seats are available for individual sale, and even the Raptors are getting in on the act now, with the sell out sign posted almost all the time. Extra Point - "The Sprite Zone", which is 4 upper deck sections in the corner of the ACC, offers seating in a non-alcohol section, and guest relations entertainers passing out prizes and holding contests throughout the game. Best of all, the ticket price - CDN$12.50 for a Raptors ticket. Folks, with the exchange we got a see an NBA game for $7.90. How good a bargain is that! Extra Point - For our March, 2002 visit, the Leafs game took nearly 4 hours to complete, what with a lengthy pregame ceremony, then a delay because an honoree was stricken with a heart attack just before stepping onto the ice (we learned he did not make it), then another delay when a Chris Gratton slapshot shattered the glass behind the net, and that had to be cleaned up. Did we mention overtime??? Good job Toronto! A great venue and a great hockey experience, not to mention the electric basketball crowds cheering on their beloved Raptors.. Definitely one of the favorites on our list and a venue we look forward to visiting again and again. And best of all, when you go to the Air Canada Centre, you are in the middle of one of the world's great cities! Check out the nice hotels, restaurants, the attractions, the nightlife, shopping on Yonge Street. Everything you would want is right here! Toronto, Ontario - The Air Canada Centre, which is approaching its 10th birthday in February of 2009, is in the early stages of a C$50 million facelift, and the most noticeable change for this season is the addition of high-definition video screens to the scoreboard. The rest of the ACC renovations and an addition will be finished for the start of the 2009-10 NHL season. By then, the Leafs will have added a 20,000-square-foot atrium to the front of the ACC's west side and completed a host of renovations to the arena itself. The atrium, which will cost C$25 million, will have a 50-by-80-foot video screen on its outside wall, which will overlook a plaza that will be used for parties and other celebrations. On the inside, there will be a walkway to the hotel and condominium project going up a few feet away, a television studio and lots more food and beverage outlets where fans can spend their cash. It is all part of a C$500 million venture between the Leafs' parent company, MLSE, Cadillac-Fairview Corp., and Lanterra Developments. When it is finished in the spring of 2010, the project will have twin towers, one with 875 condos, the other housing a boutique hotel, plus office and retail space. MLSE also has big plans for using the plaza between the towers and the ACC. MLSE president Richard Peddie and company are chasing the 2012 NBA all-star game and the NHL all-star game the following year. They also wanted the 2012 world junior hockey championship but were rebuffed by Hockey Canada, which split the event between Edmonton and Calgary. "We're going to have all these young people in the neighborhood and in our restaurants and there will be tax dollars for the city," Peddie said. "It's going to be great. We love it. We can do the pre- and postgame events. People can come down to events and watch [on the outside video screen]." Oh, and forget it if you want to get in on the parties by buying one of those 875 condos. They were sold out two years ago, not long after the project was announced, for an average price of C$450 a square foot and range in size from 500 to 2,000 square feet. Toronto, Ontario - The Air Canada Centre opens its doors to fans this fall with C$48 million in renovation work complete. The work includes a 50-by-30 foot high-definition outdoor screen on the west side of the building. It's part of a pedestrian plaza and new entrance to the arena and provides a gathering place for ticketless fans to watch games being played mere steps away. "We want to create a little Times Square feeling," said Bob Hunter, the executive vice-president for venues and entertainment of MLSE. The plaza area, surrounded by the residential and retail development the company is also building, can accommodate about 6,000 spectators, said Hunter. The facelift to the arena is centered on the western edge of the building and includes a new concourse and main entrance and the studio that's the site of Raptors and Leafs pre- and post-game TV broadcasts. There is little to notice in the actual bowl of the arena although a new hydraulic system of seating will make it possible to convert the arena from hockey to basketball quickly enough to potentially allow for both the Raptors and Leafs to play home games on the same day. The revitalization of that side of the facility coincides with the development of two residential towers that will include restaurants, retail facilities and condominiums and which will open early in 2010. Toronto, Ontario - The Toronto Maple Leafs say that for the first time since moving into the Air Canada Centre, that some luxury suites remain available for lease. The team hasn't said how many of the 152 suites are available. The team does not believe this is the first sign that fans are growing weary of the product. "We're certainly aware of the tipping point theory," Richard Peddie, president and chief executive officer of Maple Leaf Sports and Entertainment, which owns the team, said. "We have not experienced it. But listen, winning is the best thing you can possibly do. People want to be entertained, but they want to be entertained and win. We know we've got to turn things around, and we will." The Leafs, who still announce sellouts of 18,800 people at the ACC, have just three wins in 19 games this year. They have not made the playoffs since the 2003-04 season and last won the Stanley Cup in 1967. "We've got a couple of empty right now and that is a change for us," Peddie said. "But we've renovated all of the suites and we've got our best sales people onto it and we'll get through this." Peddie would not specify how many of the suites are not being used. But in a recent home game against the Calgary Flames, reports said at least half a dozen boxes were unoccupied. Peddie said the weak economy is as much to blame for the situation as anything else and that the Leafs are not the only NHL team to feel the pain. "If you check markets like L.A., Chicago, New York, they haven't leased out all their suites either," he said. "So it's the norm." stake in Maple Leaf Sports and Entertainment, owners of the iconic Toronto Maple Leafs, to Rogers Communications and BCE for more than C$1.2 billion. The sale would include the Air Canada Centre. Reports surfaced two weeks ago that Rogers and BCE had been working on an alliance to share control of MLSE, which also owns other sports properties and lucrative broadcast interests. At that time, Teachers, one of the country's biggest pension plans with assets of more than C$107.5 billion, indicated it was pulling its stake off the market after an extensive search that formally started earlier this year. Teachers' noted that several parties had made offers. The Star reported a year ago that Teachers had been quietly talking to possible suitors including Rogers about selling its stake. Teachers' played down the story but four months later announced that it would formally explore a sale. MLSE also owns the Raptors of the NBA, Toronto FC of Major League Soccer, the Marlies of the American Hockey League, two speciality television channels and Maple Leaf Square, a condominium development adjacent to the arena. The agreement contemplates that Larry Tannenbaum whose firm Kilmer Sports own the remaining 21.47 of MLSE will stay as a shareholder and chairman of the company. He may also increase his stake or get some cash as part of the deal, according to reports. There were provisions in the existing shareholders agreement that gave Tannenbaum key rights that would make it difficult for any owner with telecommunications properties to take advantage of MLSE's rich broadcast assets without his approval. The telecommunications companies are banking on making money every step of the way from gate receipts to licensing fees for the broadcast, right down to data plans for consumers who want to watch a game, the newspaper said. "From start to finish now, Bell and Rogers now have ample opportunity to realize revenues from all their holdings," said Carmi Levy, an independent tech analyst. "It's the ultimate manifestation of vertical integration." That means MLSE owns the building where the Leafs play, as well as the method in which games are broadcast, and the Internet and wireless networks that will carry the content. "This investment fits squarely into our strategy of securing premium content and making it accessible to Canadians when, where and how they want it," said Rogers CEO Nadir Mohamed at the news conference. "Sports content is king. Let's face it nobody wants to watch a game two days later," Mohamed said. "Between the two organizations I can't think of anybody that can bring live sports to Canadians wherever they are without missing a second." BCE's president and CEO George Cope first saw this type of convergence work during the Vancouver Olympics � when he watched on his cell phone as the Canadian women's hockey team struck gold. "The penny dropped at the Olympics," Cope said in 2010 after BCE boosted its stake in CTV Inc. "It was the first time we saw the impact of these new technologies, the impact on the Internet and on wireless." Although the CRTC has made it clear in a recent ruling that companies cannot deny rivals access to their content for a fair price, Levy believes Bell and Rogers will focus on value-added content that they don't have to share. Beyond just watching a game, people are interacting with a broadcast. That means if a player scores a goal, with special applications, viewers can watch a replay, or call up different camera angles, or just look at statistics. Levy believes Bell and Rogers will make the apps free, just like offering free handsets and tablets, tied to phone contracts, but could eventually generate subscription-based revenue down the line. In addition, he thinks carriers will at some point offer different tiers of service for data plans, just like cable ranges from basic to pricier packages, dependent on usage.